After a long walk around Indian Alley, visit this restaurant and have a rest here. Visitors mention that it's fine to go here for the Mediterranean and Moroccan meal. Most guests recommend trying mouthwatering couscous, chicken and lamb. Based on the guests' opinions, the service is fabulous. You will appreciate low prices. Yelp granted Palikao the rating of 5.
service is consistently good. the bill won't break you. reminds me of a restaurant in philadelphia that i enjoyed. This place is a lot more than meets the eye. Don't get me wrong, it's a neat, attractive storefront, and it seems like your standard Mediterranean food at first glance. But this place has a lot of nice blend with French and Algerian influence.I got a pita with chicken tangine which had a nice depth of flavor alongside vegetables and sauces. The pita was unbelievably warm and fluffy. Truly my only disappointment is they can't make beds out of their pita. 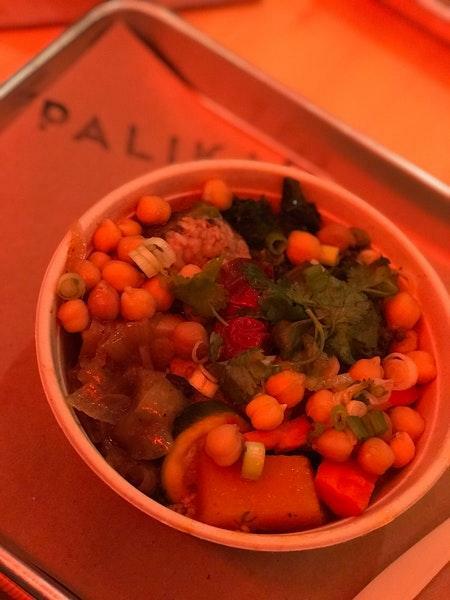 I've been to Palikao a couple of times and ordered the vegetable couscous dish. I would have to say that the flavoring is great and I enjoyed the variety of vegetables. However, I have to knock down 2 stars only because the gentleman who served us (I'm assuming he's the owner) was so careful in apportioning each veggie...as if he was going to run out of food. And I've visited early in the day- not closing time. It's just not great for a business when it appears that they're being cheap with customers.